1 Pot, 30 Minute Veggie Spring Rolls Fried Rice! 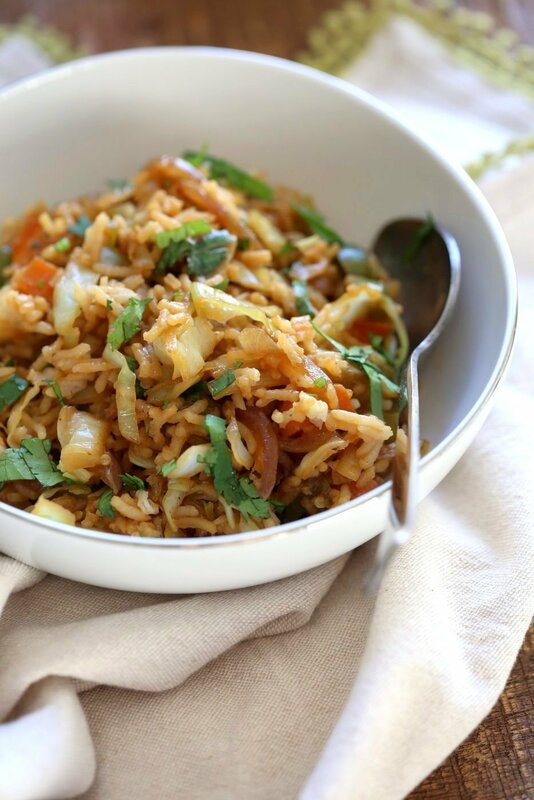 Fridge clean up fried rice with cabbage, carrots, bell pepper, with rice or other cooked grains for a quick weeknight meal. Vegan Gluten-free Nut-free Recipe. Deep fried Veggie Spring Rolls deconstructed! and tossed into rice to make a 1 pot meal. All the veggie fun and no assembly or frying. Add some toasted wonton wrappers as garnish to this fridge clean up meal for a fun weeknight dinner! 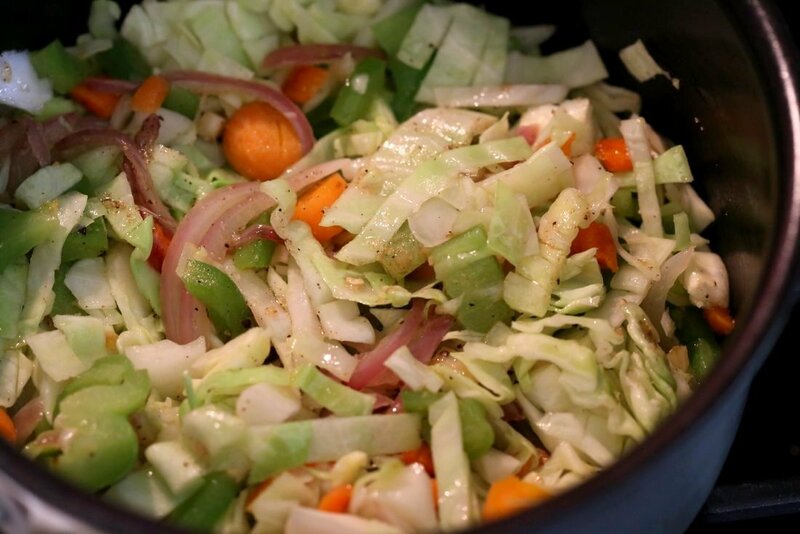 Veggies like thinly sliced cabbage, carrots and peppers are cooked lightly. Some soy sauce, ginger and garlic powder and black pepper adds flavor. You can use this veggie mixture to fill up spring roll or wonton wrappers and bake as well. 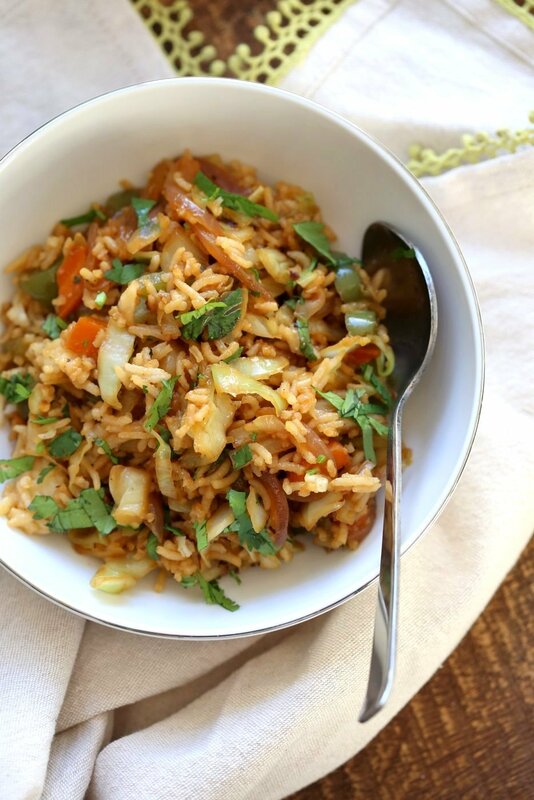 Or fold in cooked rice or grains of choice to make veggie fried rice and serve as is or as a side with some sweet and sour or kung pao dishes. Delicious! While you are here, do catch a feature about my second book on Huffington post here, talking about it on Main Street vegan here and a wonderful question answer session at VeganMofo here. Get a copy here. Back to this 1 Pot simple meal! Video: Subscribe to my Youtube Channel for all Video Recipes. More Fried Rice Meals, 1 POT! My parents are visiting this week for Diwali and my birthday! So we are on a staycation with lots of Indian food and fun. Some of the food shows up on my Instastories. There might be delays in responding to comments on the blog and social media. Do keep tagging me whenever you make something from the blog or my books! I love to see how you all serve the dishes, the changes you make in the recipes and so on. I learn so much from the feedback. Heat oil in a saucepan over medium heat. Add the onion and garlic and cook until translucent. Add carrots and peppers and cook for 2 minutes. Add in the cabbage, 1/4 tsp salt and a good dash of black pepper and cover and cook for 2- 3 minutes. Mix in the rice, salt (depending on if the rice was already salted), and mix in. Cover and cook for 2 minutes. Fluff again, taste and adjust salt , heat and flavor adding more soy sauce and white pepper if needed. Add some red pepper flakes for heat if needed. Cover and let it sit for another 2 minutes before serving. Add some toasted wonton wrappers as garnish if you wish! Would this work with brown rice? I’m trying that tomorrow I’ll let you know! Is the rice already cooked when you mix in with the veggies ?? 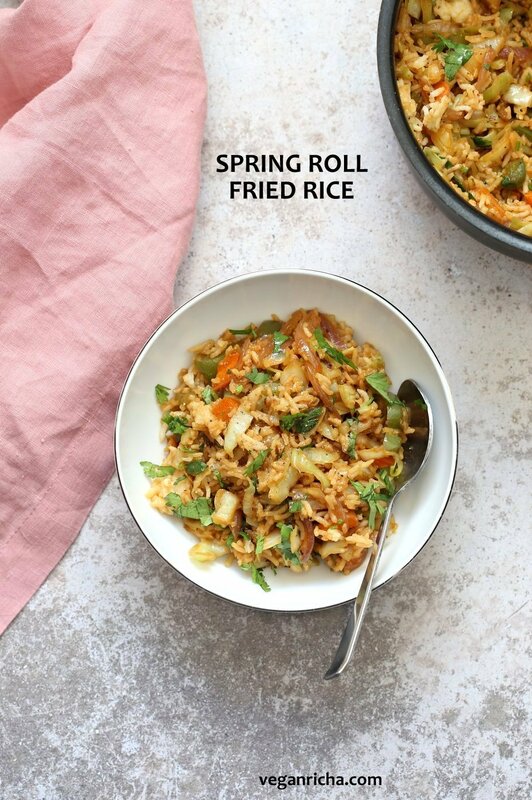 I love spring rolls, so I can’t wait to try this wonderful recipe. This looks amazing! Fried rice is one of my favorite foods to make. I made this today with brown rice and it turned out amazing. Thanks for this recipe. I skipped the sugar because I felt it was enough with the sweetness of the veggies. Hi Richa, just made this dish. I used brown basmati rice and in place of bell pepper i sliced two stalks of celery. Didn’t have an onion either so used onion powder and threw in two Tbls dried chives. Awesome! Taste like I ordered out. Easy and fast. Thanks for posting this recipe. I made this tonight, and it was delicious. My husband loved it and said our apartment smells like a restaurant! I cut up some prepared veggie burgers (Hilary’s) to add protein, making it a complete meal. He has many food allergies so meals are a challenge. This recipe will be in our regular rotation. I’ve already sent the recipe to two friends. This was the best recipe I’ve tried in a long time. The flavor is amazing (although next time I will cut the sugar down to half.) Not only is it easy but it’s also economical. 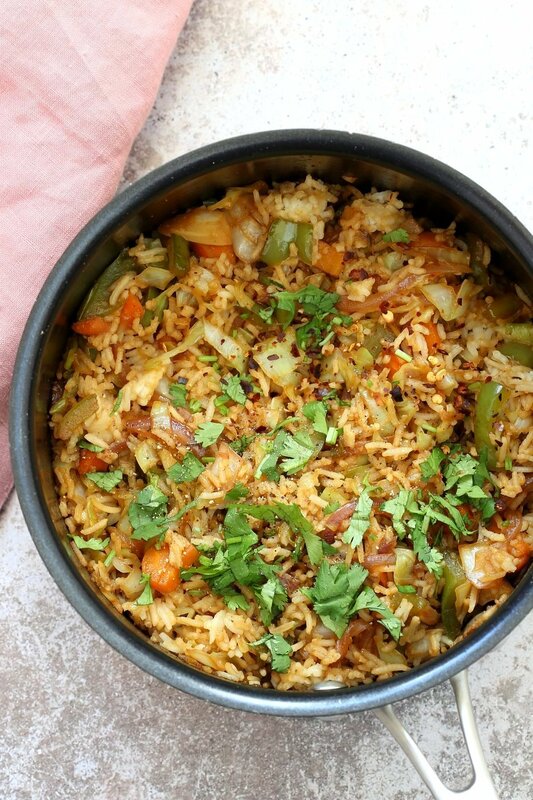 Pinned this twice- Meatless Mains and Recipes I Love. Thank you so very much. Awesome! yes adjust the salt and sugar to preference. I made this yesterday with minimal modifications and it was fantastic. – Added lots of cilantro and green onions before serving (everything is better with cilantro). -Like others noted, the veggies provided enough sweetness, so I skipped the sugar but for my taste a bit more rice vinegar was needed. This will be on our regular dinner menu, thank you! Made this tonight! It was delicious! My family loved it! Thanks for the recipe! I made this today, following the recipe exactly except for adding in some chopped mushrooms. It was phenomenal. Not only was it incredibly easy to make, it was a great way to use up leftover veggies from a couple other recipes I made earlier in the week. This dish will definitely be put in my regular meal rotation. Thanks so much. I have no sesame oil can I use olive or canola oil instead? I have just discovered your website and have the next three meals planned from it. I’ve also bought your second book on kindle. I will be going through all of your recipes and trying heaps. You have renewed my interest in the kitchen. My family and I have been vegan for 10+ years. Thats amazing!! So glad you found the blog!! Thanks for your reply! I doubled the recipe and added scrambled eggs to it. It came out amazing. My toddlers loved it. Have you made this in the Instant Pot? If so, what would be the steps? Thanks again!